A maverick form of family memoir that is mainly an extended reflection on the fear of death and on that great consolation, religious belief … it is entertaining, intriguing, absorbing … an inventive and invigorating slant on what is nowadays called “life writing”. 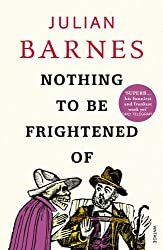 It is a collection of thoughts centred around Barnes’s fear of death and so inevitably he considers the question of religion and especially God – in fact he begins his book with this statement: I don’t believe in God, but I miss him. His agnosticism doesn’t help him with his fear of dying, but then, again, he thinks that faith does not necessarily remove the fear of death anyway – there are those who fear death among those who have faith as well as among the irreligious. But this is more than a book about dying because interwoven with his thoughts about his agnosticism and death are anecdotes about his family and himself, thoughts on literature (particularly French literature) and it’s relationship to life. I found it all fascinating, but it’s his autobiographical passages that I found the most interesting, sharing details about his family’s beliefs and the deaths of his parents and grandparents, of the rivalry between him and his brother, his mother’s solipsism and manipulative behaviour, his father’s seemingly passive approach to life and the difficulties of really knowing a person. He and his brother have different memories of their parents and grandparents and of their own early relationship, which shows how unreliable memory can be. I suppose I agree more with his brother, the philosopher Jonathan Barnes, who thinks that memories are often false and not to be trusted without external support, rather than Julian, who says he is more trusting, or self deluding, so shall continue as all my memories are true. This is by no means a gloomy, pessimistic book. It’s written in an informal tone, almost as though he is talking to the reader, and not being divided into chapters adds to that sense of being involved in a conversation. But is far from being a simple read – there is an awful lot packed into this book, an intensely personal book that reflects the complexity of our views of life and death. It gave me much to think about and even made me chuckle in parts. I think it extremely unlikely that I’ll be his last reader! Reading Challenge: Non Fiction Reading Challenge 2015. This is only the 5th non fiction book I’ve read so far this year! The full title of this book is Sisters of Sinai: How Two Lady Adventurers Found the Hidden Gospels. This is biography so well written that it almost reads like a novel. In fact, if this was a novel I would think it was a most unlikely story of twin sisters in the latter half of the nineteenth century, travelling to St Catherine’s Monastery at Mount Sinai where they discover one of the earliest copies of the Gospels written in ancient Syriac. Janet Soskice has written a compelling account of two Scottish sisters – Agnes and Margaret Smith born in 1843 in Irvine, a town south-west of Glasgow. Their mother died two weeks after they were born and they were brought up by their father, John Smith. He was unusual in that he gave his daughters an unconventional education for that period. He approved of independence of mind and foreign travel. The girls had an aptitude for languages and mastered French, German, Spanish and Italian whilst they were still quite young – helped by visits to each country. Their taste for learning, travels and adventure was set for life with long hours of study and plenty of exercise. Add to this intensely-held Presbyterian beliefs and Bible study. John Smith inherited a huge sum of money (today’s equivalent would be around £7 million) from a relative. He died when the twins were 23 leaving his fortune to them (which had built up considerably by then); they were very rich indeed. They decided to have a trip down the Nile. And that was just the beginning; their lives were transformed. They learnt Greek, Arabic, Hebrew and Syriac and they returned to Egypt and Sinai many times, befriending the monks of St Catherine, despite their religious differences, and getting embroiled in disputes with Cambridge academics who were initially very reluctant to accept that these two middle-aged (by then) women with no university qualifications (women were not permitted to receive degrees from the university at that time), could possibly have found anything of value or interest to them. What they discovered in a ‘dimly lit little room below the prior’s quarters’ in the monastery was a dirty volume, its leaves nearly all stuck together, written in Syriac. It was a collection of lives of women saints, but written underneath that was something else that was clearly an earlier text – of the Gospels. This was a palimpsest – the earliest writing having been scraped off and overwritten at a later date, the old ink becoming visible at a later date through the effects of the atmosphere. This eventually proved that the Gospels had been written much earlier than had previously been thought, moving the date back to the late second century. Not only is that remarkable in itself, but it is astonishing to me that these two middle-aged women travelled to Egypt, Sinai, Jerusalem and beyond at the latter half of the nineteenth century across the desert on camel or walking miles on foot. Their courage and resolve overcame all the difficulties they encountered, coping with physical discomfort and dishonest dragomen abroad and the hostility and scepticism at home. I would never have known of this enthralling book if it hadn’t been for Cath’s review of it on Read-Warbler. I was intrigued and looked for it in my library straight away and was delighted to find that there was a copy in another branch. Biographies and historical books are probably my most favourite of non-fiction books and accounts of the Bible and how it came to be compiled have long been of interest to me, but I hadn’t come across these two sisters before. Janet Soskine has thoroughly researched her subject and the book is complemented by a ‘select’ bibliography that runs to nearly 5 pages and an extensive index. This is an excellent non-fiction book, just right for Peggy Ann’s Read Scotland 2014 Challenge. In the past I have read many books on religion, mainly on Christianity, but I am not currently a church goer and I know little about the Anglican Church and next to nothing about the Scottish Episcopal Church – Richard Holloway was the Primus of the latter. 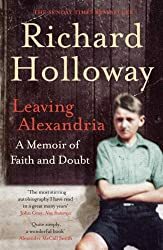 Reading Richard Holloway’s own account of his beliefs and doubts was without doubt an eye-opener. Leaving Alexandria is fascinating. Richard Holloway grew up in Alexandria, a town in the Vale of Leven, north of Glasgow. At the age of fourteen he left home to train for the priesthood at Kelham Hall in Nottinghamshire, the mother house of the Anglo-Catholic Society of the Sacred Mission, an order that trained uneducated boys for the priesthood in a monastic setting. Subsequently, he worked in Africa, the Gorbals in Glasgow, Boston, and Old Saint Paul’s in Edinburgh before becoming the Bishop of Edinburgh. His resignation in 2000 as the Bishop of Edinburgh came when he was 66. Religion is human, and like humanity it is both a glory and a scandal. It is full of pity and full of cruelty. Just like us. So is the Bible. He resigned at odds with many strongly held Episcopal Church doctrines and beliefs, and precipitated by the publication of his book Godless Morality. It was because of the Church’s insistence on rules, its attitudes towards women and homosexuals, and its inability to understand the nature of myth. But he had struggled all the way through, feeling himself a disappointment, often knowing that he was a ‘double-minded man’ and ‘unstable, if not in all my ways, then certainly in many of my attitudes and opinions. Janus-like, I seemed able to look two ways at once, be in two minds about things.’ My question is not why he resigned, but why it took him so long, and how had he become a bishop at all? I am sure that I have not really done justice to this book and refer to this review of Leaving Alexandria by Mary Warnock in The Guardian/The Observer 19 February 2012 and to an interview with Richard Holloway at the Gladstone’s Library 26 February 2012. I thought I would remind myself of the concept of the Sunday Salon. So I’ve copied this from the Sunday Salon home page – imagine yourself in some university library’s vast reading room. It’s filled with people–students and faculty and strangers who’ve wandered in. They’re seated at great oaken desks, books piled all around them, and they’re all feverishly reading and jotting notes in their leather-bound journals as they go. Later they’ll mill around the open dictionaries and compare their thoughts on the afternoon’s literary intake…. That’s what happens at the Sunday Salon, except it’s all virtual. Every Sunday the bloggers participating in that week’s Salon get together–at their separate desks, in their own particular time zones–and read. And blog about their reading. It’s grey outside and it’s raining, so I have some time today to sit and read and then write, even though I should really be sorting out what to pack, what to throw away, and what to take to the charity shops in preparation for moving house. Today so far I read over my breakfast a few chapters from All the Colours of Darkness by Peter Robinson. This is the second Inspector Banks mystery I’ve read and I’m only at the beginning of this one. So far two bodies have been discovered. One is the body of theatre set designer Mark Hardcastle and appears to be a suicide. But when the second body is found Inspector Banks is dragged back from leave to head the investigation because a senior and experienced officer has to be seen to be in charge. I’ve just made the mistake of glancing at some reviews on Amazon, in which some people have said how disappointing this book is and not up to Robinson’s usual standard. Not everyone agrees of course and I’ll wait until I’ve read it before passing judgement. I wanted a break from reading crime fiction and wondered what to pick up whilst having a cup of coffee (I’m on my second cup of the day now). I had started Dewey: the Small-Town Library Cat yesterday but it didn’t match my mood this morning. I didn’t feel like a sentimental read, so instead I read some more from Karen Armstrong’s book The Case for God. This is non-fiction indeed – although some may argue that religion is fiction! Any attempt by me to summarise this book would be futile. Basically it’s a run-through of the ideas people have had about ‘God’ over the centuries. I like to know an author’s background and qualifications when I’m reading a book like this. I know that Karen Armstrong became a nun in the 1960s and then left her order and eventually became a writer and broadcaster. According to the information on the book jacket she is also a passionate campaigner for religious liberty, and was awarded the Franklin J Roosevelt Four Freedoms Medal in 2008 for her work. I’ve seen her in discussions on TV and respect her views and way she puts them forward, but I would like to know more about her own personal beliefs. In a way that would become habitual in the modern critique of faith, he had presented a distorted picture of ‘religion’ as a foil for his own ideas, selecting one strand of a complex tradition and arguing that it represented the whole. I’ve yet to read what she says about Richard Dawkins, that comes later in the book – should be interesting too. I haven’t decided yet what I’ll be reading later today. I think I’ll listen to Jerry Springer on Desert Island Discs on the radio this morning. There is a new series on BBC tonight that looks as though it should be good – Garrow’s Law . This is set in the late 18th century – a young, idealistic barrister, William Garrow, is given his first criminal defence case at the Old Bailey by attorney and mentor, John Southouse. So it’s back to crime fiction. It’s based on real cases and William Garrow was a barrister who revolutionised the legal system. So I may not read any more today – other than other Sunday Salon posts that is.